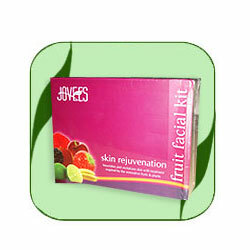 Jovees fruit facial kit for your skin shall provides many benefits. This Kit contains six products and each product has been designed with utmost care using precious herbs and fruit extracts that have natural properties to rejuvenate the skin and give glow to the skin. The major fruit extracts used include papaya, apple, banana, avacado. The enzymes in the papaya helps to remove dead and flaking skin, bananas helps moisturize the skin. Generally, fruit facials nourish the skin with essential vitamins and provide antioxidant protection. The facial be done using products as per the order given below. Skin care is incomplete without a scrub. A facial scrub ensures that your skin is free from any dead skin and dirt. This scrub has been developed using high quality granules along with herbal and fruit extracts to give you a fresh and radiant skin. This facial scrub ensures that you have healthy breathing skin on the face, and that the natural moisture and glow of your face does not go dull. Apply all over face and neck and gently massage into the skin for two minutes and wash with plain water or use moist cotton swab to take it off. Honey, Almond Oil, Wheat germ oil, Walnut shell powder, Strawberry, Orange peel powder. Papaya and Pine Apple contain enzymes that soften and heal the skin. This scientifically developed massage cream contains precious herbs along with vitamins that restores a smooth radiance and collagen elasticity to the skin. it will help in cell renewal processes, remove dead epithelial cells, helps increase cell turn over leaving skin radiant and luminous. Massage gently using circular strokes for 20 minutes using plain water or raw milk to massage into the skin. Remove with moist cotton swab or wash thoroughly with plain water. Papaya Enzyme, Wheatgerm, Avocado, Pine apple extract and Vitamin E.
Witch hazel, Basil, Aloe vera, Cucumber extract, Honey. This fruit facial pack has been developed using nutritious blend of fruit extracts that include Apple extract, which is full of vitamin A and C, Avocado extract is full of Vitamin B,D and E, and extremely good moisturising and nourishing compound assists in regeneration and rejuvenation of skin. It gives a clear, radiant and fresh look. Apply a thick layer all over face and neck. Leave on for 20 minutes. Wash with plain water or remove with moist cotton swab. This light weight oil free formula enriched with Sandalwood, Vitamin A,C & E and other precious fruit and herbal extracts that penetrates deep into the skin to induce a visible radiance. It builds moisture barrier while protecting skin from the harmful effects of sun rays and shields skin from tanning. Its skin texture renewal properties help to reveal fairer, smoother and clearer complexion. Apply a small amount of cream on face and neck. Leave on. Sandalwood, Witch Hazel, Liquorice, Jojoba extract, Tea Tree extract.